is for antifreeze. Beware: it contains the chemical ethylene glycol which animals find very palatable, but which is actually poisonous to them. So after topping up your car radiator, replace the bottle top firmly, mop up any spillages and keep out of your pet’s reach. is for burns. If you have an open fire in your living room, use a guard to stop your pet from lying too close and getting its coat singed. is for chocolate, which is poisonous for dogs and cats. Never give it as a treat. is for dark days – keeping pets active and happy in winter is good for their health – and ours! Leading veterinary charity PDSA is keen to ensure this message is as widespread as possible! is for engine. Animals – and cats in particular – may climb into the warm bonnet of a newly parked car. Before you start the engine, it is worth rapping on the bonnet to scare away any sleeping animals that might be taking cover in there. is for food. Like you, your pets may need more energy to keep them warm in the colder weather. Keep a close check on their body weight and body condition and adjust their food ration accordingly. is for garage. 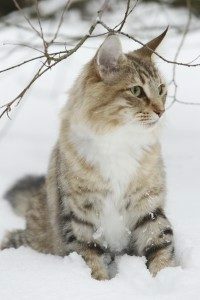 Cats have a habit of creeping into sheltered, warmer places in the winter. Make sure you check your cat hasn’t followed you into the garage before shutting the door for the night. is for hypothermia. Locking your pet in the car in winter can be just as dangerous as leaving them cooped up inside it in hot weather. The PDSA says that just a few minutes in a cold car can lead to hypothermia, so never leave them in a car. is for ice. Never let your pet walk on frozen ponds or lakes, even if the ice looks thick – they may fall through and become trapped. is for joints. Watch out for your older pets, their joints can get stiffer in colder weather. Speak to your vet if you are worried. is for keeping your cat indoors at night. This will reduce the risk of them being involved in a traffic accident – visibility is a huge problem for animals and humans on the road at this time of year. is for leftovers. Ensure your companion doesn’t help themselves to those tasty leftovers on the side after all these winter roast dinners. Rich, fatty foods can be harmful to your pet’s digestion. 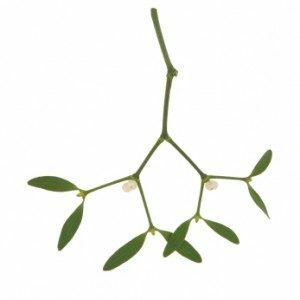 is for mistletoe. 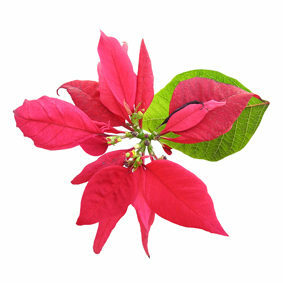 This is one of many seasonal plants that can be toxic to pets. Keep it out of the reach of curious companions. is for noise. Fireworks parties used to be an annual event but in today’s multicultural society, there are reasons for celebrations all through the year. Keep your pets indoors on New Year’s Eve and on other major religious holidays. is for older dogs and cats. Elderly pets may suffer from the same arthritic pains as their ageing owners. Show them a little extra consideration in cold weather. is for presents – obviously you want to show your pets how much you love them. Think about some fun, interactive toys or a new warm bed instead of food-based treats. is for quantity of food. It is really important to weigh your companion’s food at every meal – they may need less if they are more sedentary in the colder weather, or more if they are going outside a lot in the cooler conditions. is for reflective collars. It’s a good idea for your cat to wear one if they are out and about after dark. is for salt. If your pavements have been salted, make sure you wipe your pet’s paws to prevent irritation. is for temperature. If you decide to keep your pets inside in extreme or dangerous winter weather, do keep a close eye on their weight and body condition score and use indoor play to help them exercise. is for understanding. Make sure you give your pet space over the holidays. Cats, in particular, are very private creatures – if you have lots of visitors give your cat a place to hide and feel safe in the house. is for vets. It’s worth taking your companion for an annual check-up, as undiagnosed conditions (for example diabetes) may affect a dog or cat’s ability to cope with cold weather. is for weighing your pet regularly. If a pet is losing weight, it can be difficult to spot through a thick winter coat. is for Xmas trees. 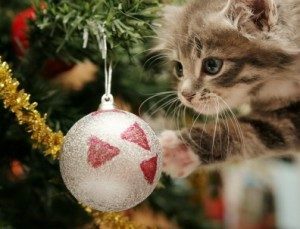 They are decorated with lots of things – electrical lights, glass baubles, tinsel – that may fascinate pets, especially kittens. Don’t leave them unsupervised or they may get into trouble. is for ZZZZ. 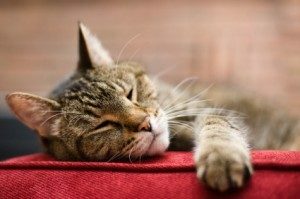 Cats sleep on average around 16 hours a day! So make sure your pet has a warm, safe place to sleep this winter.